The House and Senate are one step closer to convening a conference to resolve the differences between their respective energy bills. On May 25, 2016, the House approved an 806-page amendment to the Senate’s energy bill (S. 2012) that includes the House passed energy bill (H.R. 8) and over 30 other provisions dealing with energy and natural resources issues. As described in the January 2016 Newsletter, the bill maintains the H.R. 8 hydro licensing reform provisions improvements, including provisions that designate the Federal Energy Regulatory Commission (FERC) as lead agency for coordinating federal authorizations from all agencies needed to develop a project, requiring all such agencies to coordinate their activities and environmental studies early in the authorization process, and directing FERC to work with agencies in developing a comprehensive schedule for final disposition on such authorizations. In addition, the House amendment to S. 2012 included provisions to extend the start of construction deadline for six hydropower projects that had passed the House of Representatives in March. Following passage of the amended S. 2012, House leadership released the names of 40 conferees that will negotiate a final bill in a conference with the Senate. The next step is for the Senate to vote to go to conference with the House and name Senate conferees, which is expected to happen during the June work period. On May 5, 2016, exactly two years after requesting authorization to use FERC’s two-year pilot licensing process, FERC issued an original license to FFP Project 92, LLC for the Kentucky River Lock & Dam No. 11 Hydroelectric Project No. 14276. As previously reported, the Hydropower Regulatory Efficiency Act of 2013 (HREA) directed FERC to investigate the feasibility of a two-year licensing process for hydropower development at non-powered dams and closed loop pumped storage projects, to develop criteria for identifying projects that may be appropriate for a two-year process, and to identify pilot projects and implement a two-year licensing process. On January 6, 2014, the Commission solicited proposals from potential applicants to test such a licensing process, and defined the minimum criteria for projects that may be appropriate for licensing within a two-year process. On May 5, 2014, FFP Project 92, LLC requested to use the two-year licensing process to prepare a license application for the proposed Kentucky River Lock & Dam 11 Hydroelectric Project in order to add hydroelectric power generation to the Kentucky River Authority’s existing Kentucky River Lock & Dam 11, located on the Kentucky River in Estill and Madison counties, Kentucky. 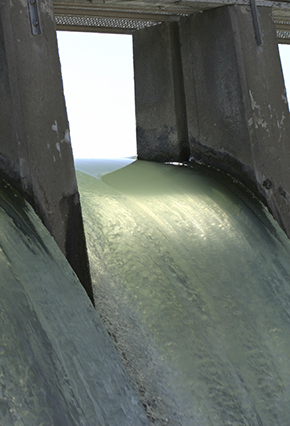 On August 4, 2014, FERC issued authorization to test a two-year licensing process for the Kentucky River Lock & Dam No. 11 Hydroelectric Project. The license for the 5-megawatt Kentucky River Lock & Dam No. 11 Hydroelectric Project is the only license issued under the two-year pilot program mandated by the HREA. At its May Commission meeting, FERC issued Order 816-A, an order on rehearing and clarification of Order 816, which refined the policies and procedures for market-based rates (MBR) of wholesale sales of electric energy, capacity, and ancillary services by public utilities. Order 816-A clarified an issue of concern to the hydropower industry. In Order 816, FERC held that hydropower licensees with MBR authority that were granted waiver of Part 101 of FERC’s regulations—the Uniform System of Accounts (USofA)—are not exempt from Part 101 with respect to compliance with their license requirements. These include the (arguably outdated) requirement of FPA Section 10(d), set forth in Part 101, for licensees to maintain amortization reserves that may be applied from time to time to reduce net investment in the event of federal takeover of the project. However, FERC clarified that licensees that sell only at MBR may satisfy all of the requirements of Part 101 by following General Instruction No. 16 under Part 101, which requires hydropower licensees to keep separate records for each licensed project relating to net investment. FERC also found that any hydropower licensee with a cost-based rate tariff on file must continue to comply with all the applicable requirements of Part 101, including the amortization reserve requirement. The National Hydropower Association (NHA) filed a request for clarification of this aspect of Order No. 816. Specifically, NHA sought clarification that a hydropower licensee with a cost-based reactive power tariff—that otherwise sells only at MBR—would not be required to comply with the full requirements of the USofA by virtue of its reactive power tariff. In Order 816-A, FERC granted the request, clarifying that hydropower licensees that sell power only at MBR will not be subject to the full requirements of the USofA simply because they have a reactive power tariff on file. Rather, such licensees may satisfy the requirements of the USofA by relying on General Instruction No. 16. However, licensees that have FERC-approved cost-based rates—rather than MBR tariffs on file—must comply with the full requirements of the USofA. On May 23, 2016, the U.S. Army Corps of Engineers (Corps) released a pre-publication version of its “Proposal to Reissue and Modify Nationwide Permits” (the Proposal). The Proposal presents a draft version of the Corps’ latest renewal of its program for “Nationwide Permits” (NWPs) that authorize general categories of construction in waters of the United States. This begins the process for renewing and revising the 2012 NWPs that are set to expire on March 18, 2017. The Corps has proposed modifications to existing NWPs aimed largely to clarify the terms of the NWPs, rather than change their substantive authorization. The Corps also has proposed a new NWP that would authorize removal of low-head dams, which is defined as a dam built to pass upstream flows over the entire width of the dam crest on an uncontrolled basis for river restoration and public safety. Once the Proposal is published in the Federal Register, the Corps will provide a 60-day comment period. Interested parties may wish to carefully review and draft comments on the specific issues for which the Corps is seeking comments that are most likely to impact their business and project development plans. For more information on the Proposal and the NWP process in general, please see VNF’s Alert. On May 6, 2016, the U.S. Fish and Wildlife Service (USFWS) announced a 60-day public comment period on proposed changes to its eagle conservation and management program under the Bald and Golden Eagle Protection Act (Eagle Act). The proposed changes include modifications to the regulations governing permits for incidental take of bald and golden eagles. USFWS simultaneously announced a public comment period on a related proposed programmatic environmental impact statement (PEIS). The proposed rule and PEIS are underpinned by a report, “Bald and Golden Eagles: Status, trends, and estimation of sustainable take rates in the United States,” which compiles research on the population status and assesses trends of bald and golden eagles. The report indicates that bald eagle populations are continuing to rise but golden eagle populations may be starting to decline. The proposed rule sets objectives for eagle management, addresses how populations will be monitored and managed, directs how data on permitted eagle mortality are obtained and used, and provides a framework for how the incidental take permitting system fits within the overall framework of eagle management. It would extend the maximum term of an incidental take permit from five to 30 years, subject to a review every five years during the life of the permit and to the requirement that in order to be considered for a permit with a term longer than five years, an applicant must commit to adaptive management measures for “preservation” of eagles. Preservation is defined to mean “consistent with the goal of maintaining stable or increasing breeding populations.” Language would also be added to include persistence of local populations so as to better define conservation and mitigation efforts at the local scale and respond to state, tribal and other stakeholder concerns. Other proposed provisions address compensatory mitigation requirements for golden eagles, application requirements, and permit fees. The proposed rule, PEIS, and report are available at the USFWS website. USFWS is accepting comments on the proposed rule and the PEIS until July 5, 2016. On May 26, the National Marine Fisheries Service (NMFS) published final regulations for the designation of experimental populations under the Endangered Species Act (ESA). The regulations implement ESA Section 10(j), which authorizes the release of a listed species outside its current range if NMFS determines that such release will further the conservation of the species. NMFS’s regulations, which are modelled after existing USFWS regulations, provide the procedures for establishing experimental populations, determining whether they are “essential” or “non-essential,” and promulgating appropriate protective measures. NMFS has previously established three experimental populations of salmonid species, and these final regulations will apply to future reintroduction efforts. As reported in the January 2015 Newsletter, the December 2014 Tax Increase Prevention Act amended Section 45(d) of the Internal Revenue Code to extend retroactively for 2014 most of the tax incentives, including the hydropower production tax credit (PTC) and investment tax credit (ITC) provisions, that expired in 2013. As reported in the January 2016 Newsletter, the Protecting Americans from Tax Hikes Act of 2015 (PATH Act) extended both the PTC and ITC for qualified hydropower to facilities the construction of which begins before January 1, 2017. The Treasury Department’s guidance for the PTC and ITC provides that a taxpayer may establish the beginning of construction by either (1) starting physical work of a significant nature (Physical Work Test), or (2) paying or incurring five percent or more of the total cost of the facility (or of the cost of new equipment at a retrofitted facility) (Safe Harbor). Both methods require a taxpayer to make continuous progress towards completion once construction has begun (continuity requirement). On May 5, 2016, the Treasury Department issued Notice 2016-31. The notice modifies the deadline for the Continuity Safe Harbor by modifying the in service deadline. Under the modified deadline, if the facility is placed in service by the later of (1) a calendar year that is no more than four calendar years after the calendar year during which construction of the facility began or (2) December 31, 2016, the facility will be considered to satisfy the Continuity Safe Harbor. For example, if construction begins on a facility in January 2016 and it is placed in service by December 31, 2020, the facility will be considered to satisfy the Continuity Safe Harbor. On April 26, 2016, the Bureau of Ocean Energy Management (BOEM) announced the availability of “A Guidance Document for Characterizing Tribal Cultural Landscapes.” The Guidance Document—a joint publication prepared by BOEM’s Pacific Region, the National Oceanic and Atmospheric Administration’s Office of National Marine Sanctuaries, and the Tribal Historic Preservation Offices of the Makah Tribe of Washington, the Confederated Tribes of Grand Ronde Community of Oregon, and the Yurok Tribe of California—is intended to enhance the effectiveness of agency consultation with tribes and other indigenous communities in the planning and development of offshore renewable energy infrastructure along the Pacific coast. The Guidance Document was developed in part because federal agencies recognized that increased interest in the development of offshore renewable energy along the Pacific coast would have corresponding impacts to important Native American coastal and marine sites in the region. Accordingly, BOEM and its federal and tribal partners seek to utilize a multidisciplinary approach whereby resource management decisions are informed by traditional knowledge, environmental science, historical information, and archaeological knowledge. By utilizing the practices outlined in the Guidance Document, BOEM hopes to be able to better identify tribally significant sites and to incorporate that data into its planning decisions for the development and siting of renewable energy infrastructure. As reported in the April 2016 Newsletter, on March 8, 2016, the USFWS issued proposed revisions to its Mitigation Policy, originally issued in 1981, which guides the agency’s recommendations on mitigating the adverse impacts of land and water developments on fish, wildlife, plants, and their habitat. USFWS’s revised Mitigation Policy is in response to President Obama’s November 3, 2015 Presidential Memorandum on the mitigation of development impacts on natural resources. The Presidential Memorandum instructs the Department of the Interior, the Department of Agriculture, the Environmental Protection Agency, the National Oceanic and Atmospheric Administration, and the Department of Defense to adopt a “clear and consistent approach for avoidance and minimization of, and compensatory mitigation for, the impacts of their activities and the projects they approve,” and provides for individual agencies and departments to issue guidance and implementing regulations to effect the policy. Comments on USFWS’s revised Mitigation Policy were originally due on May 9, 2016. In response to requests for additional time to comment, on May 12, 2016, USFWS reopened the comment period and established a new comment deadline of June 13, 2016.